So you're not an expert photographer. Maybe it's your first eclipse and you want to have some photo's as a memento. What do you do? We've all marvelled at the inspirational images of expert eclipse photographers like Miloslav Druckmueller, Fred Espenak and many others. Should you try to take your own pictures or just "borrow" the work of the experts? I suggest you do a little of each. Eclipse photography is both very easy and very difficult. Very easy because, providing you take off the lens cap and solar filter, almost any exposure will show some sort of image of the corona. This is because the corona spans an enormous brightness range. It is this brightness range that make it so difficult to get superb results. High quality close up photography of the corona is a significant technical challenge. Here are three simple photographic projects that don't require anything more than a digital camera, film camera or videocam and will leave you most of the time to just enjoy the eclipse. The big problem is that solar corona contains a great variation in intensity from the inner corona to the outer corona. The brightness ratio from the inner to outer corona is about 13 photographic stops or 8000:1. Film can only record a brightness ratio of about 100:1. Some would argue much less. A typical digital sensor can record about 8-10 stops, some high end cameras have a dynamic range of 13-14 stops but even very skilled photographers won't easily convert this int a continuous range image of the corona. Your eyes can adjust and adapt to an enormous range of intensities. So you can see it but you can't capture it on film or digital camera very easily. Dust off the old film camera, digital compact or DSLR. Take the widest-angle lens you have. Set the camera on a tripod. Set the camera to auto mode. Set the compensation control to -1eV. Best results if you set the camera to Av mode and set the aperture to f5.6. Set the ISO to the lowest setting ISO100 or 200 depending on the camera. Compose on a tripod so that the Sun, the sea and a big swathe of sky feature prominently in the frame. Don't forget to include yourself in the photo. Set the camera to fire at regular intervals with an intervalometer, or by remote control. Gobi Desert, August 1st 2008. The Sun is only 14o above the horizon. Taken with a 35mm film camera with an 18mm lens (equivalent to a DSLR with a 12mm lens). Taken at Jinta near Jiayuguan, Gansu Province. In this shot taken at totality, the Sun was 14o high in the sky but in the west in the late afternoon. 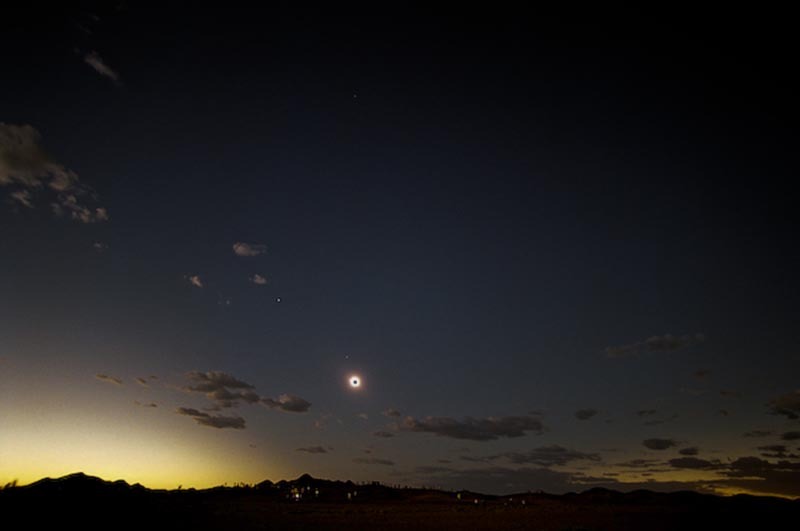 For observers in Cairns, the Sun will be at a similar altitude in the east early in the morning during the November 2012 eclipse. I've seen many videos of total eclipses, some taken with very expensive video cameras. Skilled videographers can capture great video of eclipses. I am not one of them. There are a lot of very poor, shaky and blown out close up vides of coronas around. This shaking is caused by the photographers needing to fiddle with settings on the camera while imaging. Imaging the corona with zoom will take a lot of time and effort and in my opinion isn't worth it. The problem is that most video camera, even very exensive ones can't cope with the huge range of brightness. But here's an easy method that requires very little attention that will leave you free to enjoy the eclipse and give you a good chance of success. I developed this method as a stand-alone set and forget method. It will work on practically any video device with a wide angle lens. Most video cameras do an excellent job of recording a very wide field view of an eclipse. Totality will be over exposed however the sky and the shadow of the moon travelling across the sky records beautifully. If you can afford to, buy a screw on 0.5x wide-angle adaptor for an even better result. If not just set the lens to it's widest angle setting. Set the camera to manual focus, focus on infinity. Exposure compensation (if available) set to -1eV. Set the video camera low to the ground on a tripod behind you then it records you, your reactions during the eclipse and the shadows moving across the sky. Assess your surrounds, make sure nobody will steal the camera. If you are in a crowd, don't put it behind you. Keep it close in front of you. Once again the foreground will be dark and your figure will be in silhouette so don't waste too much of the frame with the foreground. The horizon line should just be a thin strip along the ground. Filling the frame with the sky will assist the camera's exposure system to expose the sky correctly. The shadow will approach from the west sometimes sweeping across from the northwest or the sounthwest. You could point the camera to the west away from the eclipsed Sun to capture the approaching shadow then swing the camera around to the east during totality or compromise. You might like to shoot some short clips before the eclipse and during the partial phases. To shoot the partial phases, you can buy an extra pair of eclipse shades, cut them in half and tape one to the camera as a make do solar filter. Just remember to bring the tape with you. Over the years, I've found it wastes a lot of time if you go shopping around for mundane things like tape or glue. Much easier to bring it with you. Start the continuous movie of totality about 1-2 minutes before the diamond ring (2nd contact). Stop it 1-2 mins after 3rd contact. This will give you a clip of 5-7 mins. You don't want to make a 2 hr movie with 3 mins of action in the middle. nobody will want to look at it. With an ultrawide angle lens, you won't need a solar filter. Enjoy the eclipse and the camera will do all the work for you. Don't forget to talk about your experience during the eclipse so that it gets onto the sound track. So you've got a DSLR and a common 70-200mm f4 zoom lens but you don't want to bring a tripod. Relax! You can still take some perfectly good handheld snap shots. As I've said several times so far, the corona has a wide brightness range. Eclipse photographers typically shoot one exposure at every shutter speed from 1/4000 to 4 or even 8 seconds. But these many exposures are taken to apply a special technique called stitching to the pictures later where all those exposures are combined. An exposure of 1/250s at f4 at ISO 200 will give you a pretty decent shot of totality. If I had to take just one exposure to show totality this would be the exposure. If your DSLR is a Sony, Pentax or Olympus you're in luck. Your camera has built-in image stabilization that works really well with any lens or small refractor fitted to the camera and the image will be reasonably steady and sharp if you shoot within the stabilizer's limits. If it's a Canon or Nikon, then handheld at this shutter speed you'll get an acceptable image but it might be a little soft unless you have one of their special image stabilized lenses. I've recommended a higher ISO for Canon / Nikon and a corresponding faster shutter speed to allow for Canon & Nikon camera bodies attached to non-stabilized lenses. The high ISO may result in a little more noise but it is probably the best compromise. Three single exposures of the corona. The quoted exposure values are what you would use for an f4 200mm lens rather than the actual exposures because these were originally taken with a 600mm lens at f8. The exposures quoted below will result in an image similar to the middle image above albeit with 1/3 the image size. Basically an all round pleasing result. Note that these images have been greatly reduced in size from the original RAW files. Autofocus might need to be turned off and manual focus used. Use Liveview on maximum magnification to focus. Image stabilizer : Not available unless you have an image stabilized lens. Grab a photo or two using one of these methods, then put down the camera and make sure you take the time to enjoy looking at natures great spectacle.